"This green one should be a good and friendly dragon and this red one should be a fierce but good dragon. They should be named Dreams and Nightmare"
I just love those names so much! A light bulb went off in my head just then. I decided on two different looks for their faces. You will see instructions for the head that will give you either the sleepy head or the fierce head look. You decide what look you want your dragon to have. Dreams looks a little sleepy so I refer to "sleepy" or "fierce" in the instructions below. Please note: This is quite a long pattern so this page is the written part only. You can print it off by using the print friendly button at the bottom. The assembly and photos are on a separate page. There is a link at the bottom to part two of the pattern for the assembly photos and instructions. Also see copyright disclosure at the bottom of this page. This is a free pattern for all to enjoy. If you would like to leave a donation please do so by using the donation button also located at the bottom of this pattern. Donations of any size are greatly appreciated and do help me to keep on providing free patterns. *Please read the introduction at the top of this page which explains why there are 2 different instructions for the eyes and mouth. Look at the top for sizing, supplies needed and other important notes. There are videos that go through each section of the dragon if you need that extra help. There is also a page with photos and written instructions for each part if you prefer that to a video. See here. BODY: Many of the rows of the body are worked in both hdc and sc, this is done for shaping. The areas with hdc's are more relaxed. When you stuff the dragon be sure to shape as you stuff. Refer to the videos and photos (link to those at bottom of this pattern) to help you get a better idea how the shape is supposed to look. Do not worry if you see stuffing showing through the stitches on the front side of the dragon as you will be sewing a tummy patch over this entire area. There videos for each part of the dragon, I've including some links right in the parts themselves, There is also a written instruction page with photos if you prefer that to a video. See here. Starting at the bottom of the body working up to the neck. sl st next st and f/o leaving a tail for sewing. Stuff firmly so that when you sew the head in place the neck does not flop over or wrinkle. You can use wire, just be sure to loop and tape the ends of the wire so they never poke through. I used wire in one of my dragons and no wire for the others. There is no real difference except I can pose the one head a bit more than the others. *stuff head. The hdc's are the top of the head and you should be stuffing and shape accordingly. Please view the photos OR video if unsure how to properly stuff and shape. sl st next st and f/o leaving a tail for sewing. Weave in and out of the FLO of the stitches. *stuff more and shape as you stuff. Pull tight and knot off. Hide yarn tail inside head. Insert hook in between the 6th and 7th row or 7th and 8th row (depends on how firmly you stuffed, eye it up and choose by what would look better) ch 1 then make 3dc in first space and 3dc in next space, sl st into next space then f/o. There should be at least 4 visible stitch holes between nostrils. Shape the nostrils and sew the yarn tails into the head. roll and sew the end to hold the shape. One end should be closed and the other end open like a rolled taco. Make sure to roll the 2nd ear in the opposite direction so the ears match when sewn onto the dragon. sl st next st and f/o. Cut yarn tail shorter and tuck behind eye when ready to sew to the head. Use colored yarn whip stitch on a pupil, play around with it. I did one with colored yarn then black in the middle, it looks pretty cool that way. sl st next st and f/o. Cut yarn tail shorter and tuck behind eye when ready to sew to the head. Sew a solid button onto the circle. 9) 1sc in next 5st then (for Sleepy Dragon f/o here leaving a long tail for sewing) for Fierce Dragon continue on: ch1 and continue down the edge, 1sc in next 5 spaces. Once you reach the rounded part of the mouth, ch1 then 1sc in same stitch, ch1 then 1sc in next stitch, repeat all the way around until you reach the corner of the straight edge, 1sc in next 5 spaces, f/o leaving a long tail for sewing. working now along the edge to the left of your last st, you'll have to push your hook through, 2tog then 2tog then 2tog then 1sc in the outer loop of the corner. Next, working along the outer loops of the row, 1sc in each of the 15 outer loops, ch1 then working in both loops, sc around the edge and to the first inner corner, now you have to push your hook through, continue working with sc. Working along the edge of the wing tips you will have to push through what was the chain of 3 we made, push through single loops of that chain. Work in both loops of stitches when you can and work along the very outer edge of the wing trying your best to maintain the shape. Once you get all the way around, f/o leaving a long tail for sewing. working now along the edge to the left of your last st, you'll have to push your hook through, 2tog then 2tog then 2tog then 1sc in the outer loop of the corner. Next, working along the outer loops of the row, 1sc in each of the 13 outer loops, ch1 then working in both loops, sc around the edge and to the first inner corner, now you have to push your hook through, continue working with sc. Working along the edges of the wing tip you will have to push through what was the chain of 3 we made, push through loops of that chain. Work in both loops of stitches when you can and work along the very outer edge of the wing trying your best to maintain the shape. Once you get all the way around, f/o. You do not use these yarn tails for sewing, they will get tucked in between the wing pieces. If you would like to share this pattern, link back to it. Do not reprint or take photos. You can use one dragon photo from part one of this pattern for sharing and linking back to the pattern. You can sell finished products. Thank you. I hope you enjoy! Hi! Thanks you so much for this amazing pattern! At the top where you say 2 bundles of Red Heart Super Saver yarn, how much yarn is in the bundle that you are talking about? I have two rolls with 364 yds of yarn, and I was wondering if one would be enough, because I was hoping to double up and make a large dragon. Thank you so much!!!! I said 2 rolls of the super saver yarn because I think I used up a whole roll, lol. I had 2 rolls, one had some missing but I don't know how much when I started. I just needed a little bit of the 2nd roll when the 1st one ran out. So I say 2 rolls but you will not use up 2 rolls for sure. I have those planned for the future. I would predict a month or more down the road, maybe.. I really can't promise a date for the 2-headed ones. I'll need a bit of a break once I get the 3rd part and videos done for this large dragon. Plus I have some other parts like the marshmallow and fire I'll need to get posted as well. Sharon one more question please can I use thick Bernet baby blanket yarn for bigger dragon or will that not work? I can't see why it wouldn't work. I haven't tried it though so I have no advice to give, sorry! I have seen some of my patterns worked up in that yarn and posted on my facebook page and they are always so adorable and soft looking. I have to try that yarn out myself one day! Thank you for another awesome pattern, missed you here lately!! Again an amazing pattern of your hand. I love your two dragons. Thanks for sharing this pattern. What a wonderful design. Thank you so much! I am so excited about this one. I have checked every day since you posted the first pic. I am going to start in Dreams today. It's so refreshing to see someone share their great talent with others. I have never even thought about trying amigurumi until I saw your site. You are such a wonderful teacher, so easy to understand. I have MS, so using my hands daily is a must, my doctor loves that I'm doing this too. Thank you so much for your heart and your golden hands! I love your two dragons, they are so cute. Thanks for sharing the pattern. yes you can translate. Please add a link directly to part two of the pattern which is the parts and pieces and soon there will be a part three for the assembly. A link just to this blog does not help, there needs to be a link to part two or part three or both. Check back for updates as I am still updating this pattern with links to videos. I love these cute dragons, I agree the names your son came up with for them are great too. 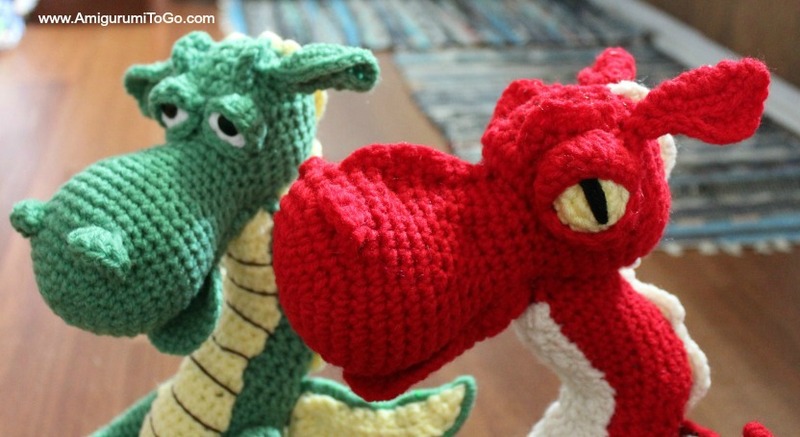 I am not very good knitting or crocheting but would love to give these a go. I hope you don't mind me pinning a link on Pinterest to your clever creations. *for rows 5-8 start in 2nd st from hook? that video is uploading right now. You will be working in rows not rounds for rows 5-8. Once you ch1 and turn you have to crochet back across and you start each row in the 2nd st. Thanks so much for this super fun pattern! I can't wait to try it. The names are pretty appropriate as well! I'm a huge fan of you designs and patterns and I love your teaching style. Because of you I was able to give my kids these figures and never had to buy a stuffed animal for them! They love them! Agradecida con todas tus atenciones, excelente patrón, me encantó y lo haré aunque despacio pues no se hablar ingles aunque con tus vídeos puedo entender el paso a paso. Muchas gracias Sharon. oh my goodness thank you. i have been searching for a dragon pattern that is cute. would be fun to figure out a 3 headed one....i am thinking crochet to a certain row and attach on sides of head...what is your thought ? 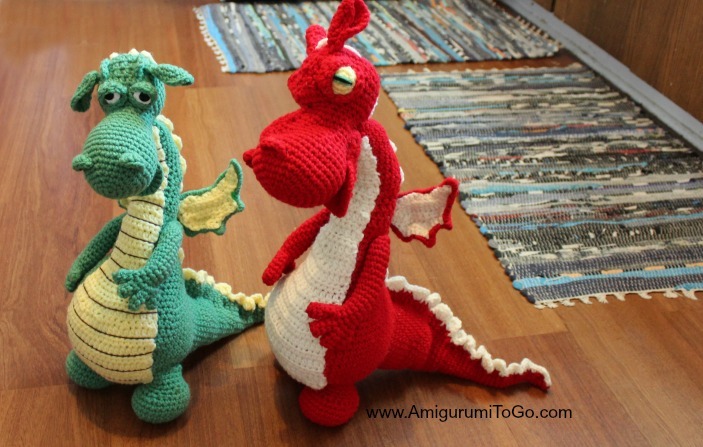 Oh how wonderful your blog is Sharon, and so kind of you to let us all share your wonderful designs!....I am fairly new to crochet, but can't wait to do a dragon....thankyou. Hi, thanks for your pattern. I like the dragons so much. I am making the arms at the moment, but I don't know how I should make fingers. Can you help me? Greets Marieke. There are videos for each part of the dragon. I just added the link to the arm section itself. The rest of the video links can be found at the bottom of the pattern. Just found your blog from the Ravelry link for this pattern and I am SOO EXCITED!! I make presents to give to kids who otherwise wouldn't have Christmas gifts and your amigurumi patterns are definitely going to be used. I've got a Fierce dragon started (completed the body and head so far) and I've found 6 other patterns to chose from next. Thank you so much for making these patterns and for offering them for free. I'm so inspired by you! Thank you very much. My son started jumping up and down when I asked him if he would like one of this. He's always asking if I finished it, LOL. Just started though. What a lovely site. Our high school mascot is a dragon, so I may have to make one in Blue and White!! Thanks so much for posting free patterns. So cute. Thank you very much for this pattern ! I checked out your page. Thank you for providing a good translation and links to videos and the original. I added a link to your translation at the top of this pattern page, in the introduction. I will use you page as a good example for other translators to follow. It's perfect! I also added the link to your translation to Ravelry. I'm really happy that my translation pleases you. you're welcome! I'm so glad you translated the pattern, that is wonderful. Thank you very much for this pattern. I am heading to the end of sewing parts together and found a prob with the wings.maybe I don't know but should they be different becsuse they are like in miror. I've made 4 of them now and countless other people have made them and not had a problem with them. Once they are sewn together, they look fine. Sharon, you saved my life with this link in french :) ! I have tried using the Bernat blanket yarn with other patterns that are worked in a continuous circle and not join but I can't get it to work. It throws off the shape. Don't really know why. Maybe someone could tell me. Sharon, I thoroughly admire your talent of designing your patterns. Your site is the best I have ever seen. Thank you. Hi Sharon. I am currently working on your sleepy dragon pattern and am really enjoying watching him come together. I have a question with regards to the wings though... in order for them to be left and right wings is it correct that I have to sew both right sides (inner and outer wing) facing for left wing and then both wrong sides (inner and outer) facing for the right wing? If I sewed the wings the same then one is upside down. Am I doing something wrong? Hope this makes sense. I did not design a left and right so you have to sew them together, left and right. Lay all 4 pieces out on the floor then assemble the inner and outer together. If unsure, pin the inner and the outer together for both sides then pin them to the dragon and see how they look. Of course, there will be no pointy shapes until you have the pipe cleaner sewn around them but you'll get an idea how they will look. I show how to assemble and sew the inner and out wings together in the video if you need help with that. about how much stuffing will I need? This pattern is FABULOUS! Am so enjoying making it, the dragon is looking fabulous and it's by far my favourite make in a long time! Such sweet little dragons! Thank you for sharing! I hope you can help me out, I seem to have a little problem with the dragons. The bodies are twistet to the right. The first dragon I made wasn't too bad, I just saw that the Tummy patch didn't fit 100% and assumed, that I stuffed it wrong. But the second dragon's head is turnd about 45 degrees away from the tummy. I started over but it happened again. I'm certain that I'm counting the rows right and I'm also using markers. Still it looks as if with every row the body turns one more stitch to the right. Any idea where the problem might be? I just started crocheting recently, and I made an elephant using your pattern! It took me around 5 days. I am rather slow, and I'm sure it would have taken longer had I not been at home as often as I was. How long do you think this dragon will take me? Or if you can't answer that, how long did it take you? Hi Sharon I just finished my second dragon I made one for my oldest grandson and the one I just finished is for my step son. Thank you so much for sharing your wonderful patterns. My next project is the Monkey. I'm so glad you enjoyed the pattern, that means a lot. You're very welcome and thank you for taking the time to comment. thank you so much, I have just finished one for my son. Sharon, you have made crocheting possible for me!! Thank you so much for sharing your pattern and especially making it print friendly, too! I am currently working on something, but plan on making a dragon sleep sack and a dragon hat for my grandson, for Christmas this year, so this should fit in nicely! Love your animal crochet it is very easy to follow. I have been enjoying this pattern so much! The wings seemed a bit small so I played around with trying to enlarge them... with little luck. I ended up mixing both colours and crocheting with both strands, making just the inner wing portion. So far it looks really good and I'm really happy with the size. Not too far off finished now and I feel like he's getting a friend soon too! What kind of stitch do you mean by "st"? the pattern is worked in both half double crochet and in single crochet. A stitch is one of those completed. If you're referring to row 1, a loop with 6st, you can start it off with 6hdc or 6sc, it doesn't matter. I already had tutorials available for a loop with 6 single crochets so I linked those in row 1. The pattern has a full tutorials to get you through each row, how to stuff and shape, and how to sew it together. you'll have to use the video that is provided in that section, right at the start of the arm section it says video here, click the word "here"
Hi. I love your patterns. I wanted to ask that the written pattern for the body is different from the one in video. In video you say 1sc and than 2sc in round three while in written it is 2 hdc in round 2,3 and so on. Am i missing something here? You are definitely watching the wrong video for the body. I just updated the written pattern with a link to the body video. Scroll up, just before the written pattern for the body starts I wrote in all caps, "The video tutorial for the body is here". Click on the word here and that will bring you to the right video. There is a playlist for the dragon videos as well, look for that and in all the titles it will tell you what part each video is for. This is - by far - the BEST written pattern I have ever had the pleasure of using, and I have made hundreds of critters over the last 5 years. The links to the step-by-step video tutorials take it off the charts. I would love to see any other patterns you have written! I have over 100 patterns on this blog you are commenting on. I've been designing and writing for 7 years. The view will differ depending on what device you are viewing from but on the right side of the page there is a label list of patterns. Click on any label to bring up more patterns such as monkey, bear and so on. Thanks for the patterns and videos. I am good at reading patterns, but the videos definitely helped more. One tip I found useful. When adding the spines up the back, I found I was going crooked. I basted 2 lines all the way up to the neck. I then just stayed between the lines. Hi ,I'm really looking forward to making this for my son, but I just wanted to know before I start, is this written in U.S. terms or U.K.? Hi Sharon, many thanks for the pattern. May I check if the marshmallow n stick video/written patterns are up? I’m so eager to finish off dreams! yes, they are. If you scroll up this page look to the right side, there is a search bar. Type in "Roasting Marshmallow" and it will come up for you. I just noticed I didn't have it listed in the label list so I fixed that. Scroll up, look to the right for the list. Look for "marshmallow" click on that word and the pattern will come up there too. Hi! I love the dragons and was thinking about trying to do one �� do you think it would be possible to use the Himalaya Dolphin Baby year, the plush one? 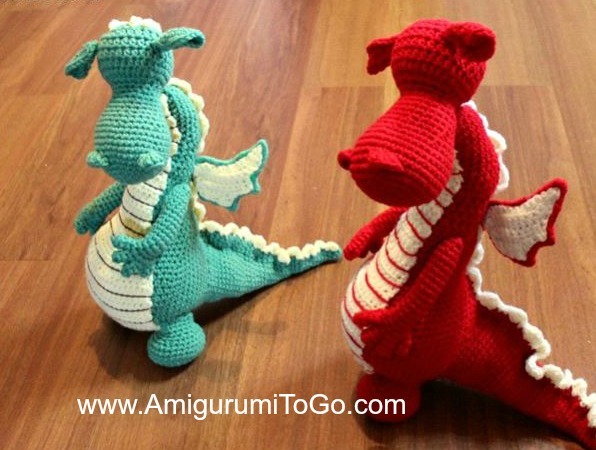 I like the idea of having a big soft dragon..
Silly question maybe, but as an intermediate crocheter of 50+ years, about how long does one dragon take? Can 2 be done in 2 weeks? I am retired and have plenty of time!! Educated guess??????? Thanks! I made this dragon my first amigarumi. I have to say that your tutorials are the VERY BEST I have every seen. You are a fantastic teacher. Love that you didn't feel you had to show every single stitch. Thank you for your work. Thank you so much for this! You've set this up so well that a beginner like me can follow it. You're awesome!